Gaur Smart Homes is the new residential project by Saviour And Gaursons Group. 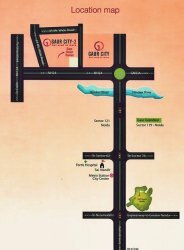 Gaur Smart Homes 14th Avenue Noida Extension is strategically located at GH-03, Sector 16C, Gaur City-2, Noida Extension. Its offers 2 bhk and 3 bhk homes with sizes of 855 sqft, 955 sqft, 985sqft, 990sqft, 1040 sqft and 1300 sqft. • 5 Km from Center Metro Station. • 10 km drive to Kalindi kunj.